If you are not content with Windows Deployment Services and looking for a WDS alternative, here it is. Is the WDS the right tool for you? Windows Deployment Services (WDS) is included in Windows Server 2008(R2)/2012(R2)/2016 as a Server Role that allows you to deploy all the Windows operating systems since Windows Vista to multiple computers over the network simultaneously. You can use Windows Deployment Services Image Capture Wizard to take an image of a custom system with installed applications and then deploy to many computers. It also works with virtual machines. You can use a virtual machine as a client machine to test the prepared system image that you want to deploy. Though deploying OS with WDS is not a complex task, even IT pros may take a little time to test and configure before actual deployment starts. If you need to something more efficient, you need WDS alternative. WDS is very useful for image deployment, but it may not meet every company’s needs. 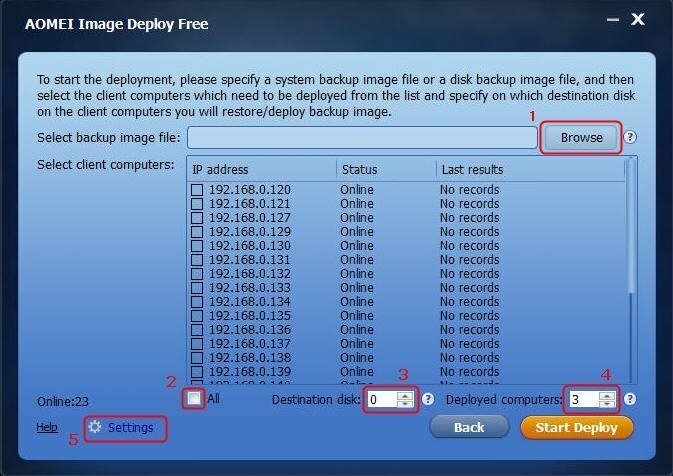 As an alternative, AOMEI Image Deploy (AID) is easy-to-use and complete image deployment software that works in Windows 10/8/7 and Windows Server 2003/2008 (R2)/2011/2012 (R2)/2016. Therefore, you can install AID on your PC besides a server to deploy system image to multiple computers. 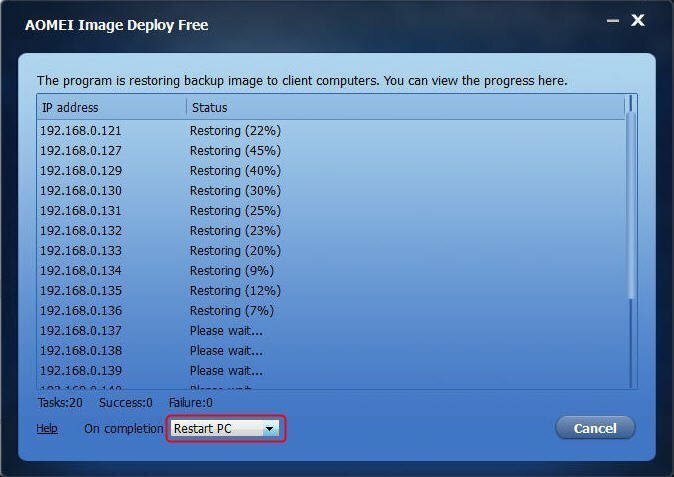 What’s more, unlike any other Windows Deployment Server alternative, it even provides universal restore feature that allows you to deploy the custom image to computers with dissimilar hardware. 1. 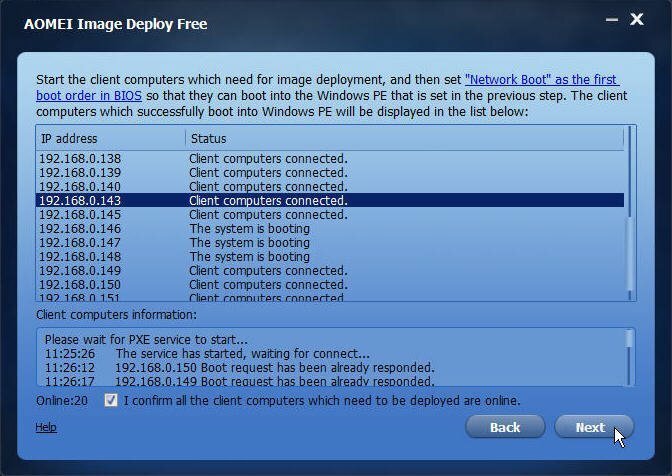 Start all the client computers and enter into BIOS to set the network boot (PXE boot) as the first boot device. 2. Download, install and launch AOMEI Image Deploy on a server or PC. 3. Create bootable WinPE ISO file manually or automatically. Check the option "Enable DHCP" if there is no DHCP server in your LAN. 4. When you see the message "The service has started, waiting for connect...", boot all the client computers. The starting screen of the client computers will be like the screenshot below. 5. When all client computers are connected, check “I confirm all the client computer which need to be deployed are online” and click “Next”. 6. Browse and select the image you want to deploy. Configure other settings based on your needs and click “Start Deploy” to get started. 7. In the next screen, you can see the image deployment is in process. Then you can decide whether to shut down or restart the client computers after completion of the deployment. Compared to WDS, AOMEI Image Deploy is quite easy to use and efficient. If you are looking for a WDS alternative, then AID is the one.